Here we have our fifth Suprenant sister. 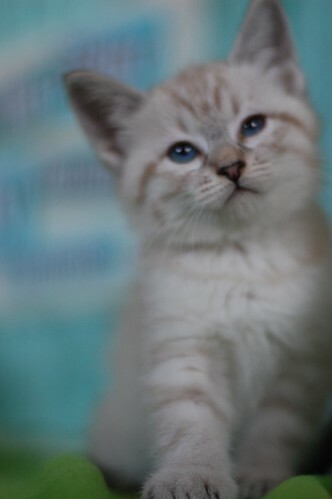 She's a lovely little lynx point. 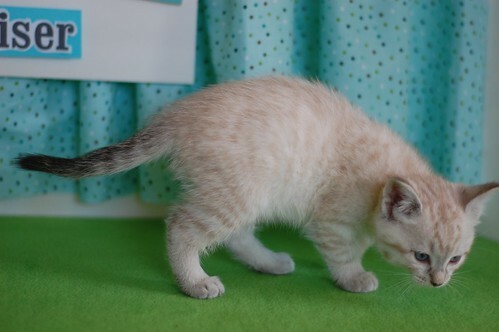 Her coat is cream and her stripes are kind of taupe-y/ soft cocoa -ish color. She's sweet and spunky, and curious about EVERYthing. ^this is 5: three tabbies, one black floof, one lynx point. it all adds up to cuteness! I can tell this particular kitty is very intelligent! She looks like she's pondering the universe. Just beautiful! Smootch! My GOODNESS these girls are just so durn PRETTY. Oh my goodness. I think my heart just skipped a beat. All of the kittens are gorgeous, but this little girl has the most beautiful colouring - I've never wanted to pick up and snuggle a kitten this much! She's perfect. I can't wait to see more photos - she's completely stolen my heart! 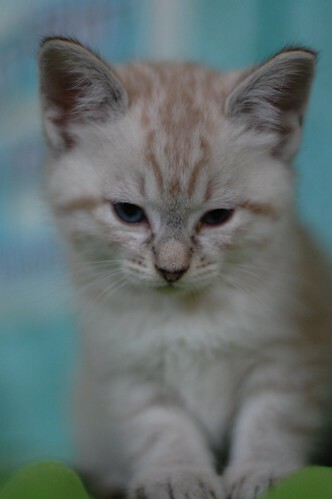 She is going to be a beautiful cat. Pretty baby! Oh my... what a pretty baby girl! I thought *I* had the most gorgeous kitty in the world... this one may give her a run for her money! The last photo definitely illustrates her inquisitive mind - and of course the telethon set background really helps bring out her colors. She's such a beauty! She looks so wise with her big Yoda ears! What an angelic face, but look out because it's always the sweetest looking kitties that are the biggest handfuls (lol). Oh goodness!! I just love lynx-points, and this wee one's face is just too much! I love the second pic: the look on her face is cross between blissed-out biscuits and kitty meditation. She looks like she's about to go into full meatloaf mode. She looks just like a snow leopard! So gorgeous. OMG, she is sooo beautiful! there will be a stampede of people who want her for their very own! oh what a cutie!! will she get along with pugs??? and where is number four? I know what "point" means, what does "lynx" mean? She's beautiful, just like her sisters. She sure is a cutie... Btw is it my imagination or does she have a slight problem with her left eye... it looks a bit smaller. Awwww! She looks so sleepy! 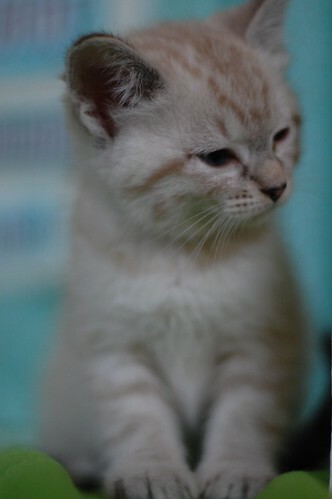 Anon: a lynx-point kitty is one whose points have a tabby pattern (as opposed to a solid color, like Charlene Butterbean). Thanks for the definition of lynx point Sarah! Oh What a beauty. Look at those gorgeous blue eyes! I was wondering about the eye, too. It looks like she may just have a little infection or something. Such a lovely girl! !